Beat Retreat Ceremony is a reenactment of a 17th century old army tradition in Bermuda. In the earlier days, a few drummers would go around the streets and play drum taps after the sunset. This served as a warning to the soldiers to get back to their barracks once the night falls. It was then known as Retreat. Today it has become an elaborate ceremony with parades performed by the Band and Corps of Drums of Bermuda Regiment and Bermuda Islands Pipe Band. 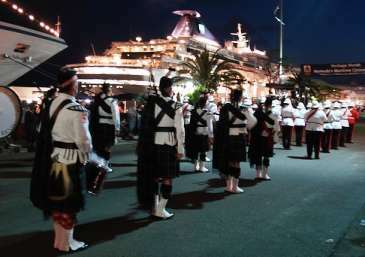 It takes place at 9pm on scheduled days of specific months and led by The Bermuda Regiment Band in their full uniform with red coats, blue trousers and white pith helmets. The bands with their pipes, bugles and drums perform in front of guests of honor and large public including many tourists who join the ceremony. The bands initially perform separately, and come together for the evening hymn. Finally the flags are lowered to signify end of the day. The bands march past the guests of honor - The Governor of Bermuda, the Premier, Mayors and other dignitaries. The ceremony is sponsored by Bermuda's Department of Tourism and Department of Community and Cultural Affairs. The ceremony is held once or twice a month between May to October (but not usually in August). It takes place either in Royal Naval Dockyard area, Hamilton City or in St. George. The venue keeps changing. It is held on Monday or Wednesday evenings at 9pm. In the photo above, the ceremony is taking place right next to the cruise berths at the dockyard. So if you visit Hamilton City on a Wednesday evening during Harbor Nights, you may be lucky to get an additional bonus and witness the Beat Retreat Ceremony which is also held on Front Street. You will need to find out the day when it is scheduled. The bands march up and down the Front Street. The street is lit up by flood lights mounted on building roofs on both sides of the street. The reviewing stand around the Flagpole becomes full with guests of honor and dignitaries. The Governor of Bermuda attends with his full military uniform. The Pipe Band performs sword dance as well. Finally they play "God save the Queen" and the flag is lowered. It's quite a show really. Go there early and take a place opposite to the Flag Pole at the corner of Front Street and Burnaby Street (near Bank of Butterfield head office). This is where most of the actions take place and is the best place to view the show. 'Beating the Retreat' is a 'must not miss' while in Bermuda. I lived and worked there for 7 years in the 70's and being from Scotland I loved to watch this every summer months. The decks of the cruise ships docked on Front Street then were packed with lucky visitors watching the spectacle from deckchairs. 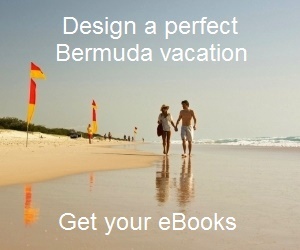 I had never been on a cruise ship and resolved to come back to Bermuda this way some day after I left. I returned recently on one of the very last cruise ships to dock in Hamilton and was delighted to find the Retreat was on and so I became one of these people to watch from a deckchair. I get goose bumps every time I think of the Retreat is so impressive.